WhyGamesMatter » Comic Con – Can You Dig It? Comic Con – Can You Dig It? I found Chicago Comic Con to be a great learning experience. Most important, I realized that I probably won’t be returning there as a customer. I enjoyed comic books as a child. 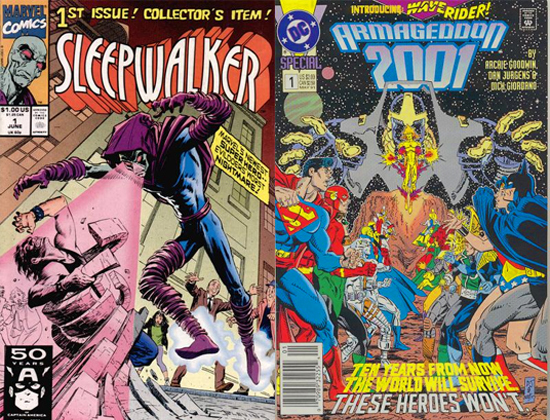 I remember the first comics I ever bought: Sleepwalker #1, followed by Armegeddon 2001 #1. In these two comics, I had the opportunity to see both a relatively crappy character, and the complete destruction of all but one of the DC superheroes. That first issue of Armageddon 2001 story was enjoyable. While not as epic as the Infinity Gauntlet series that appeared in the same year, I found Armageddon 2001 to be a much more personal story. Stand-alone video games over MMO’s. Single novels over book series. Board games over collectible card games. The thing that I learned from this year’s conventions series was that, while I am a casual comic hobbyist, I am a emphatic game enthusiast! As a gamer (and thus, a geek), I thought that I would find comic Con to be just as interesting to me as the gaming conventions. Unfortunately, the excitement I felt at last year’s PAX, Origins, GenCon just wasn’t there for me at Comic Con. While I enjoyed the celebrities (especially Richard Roundtree), I would have rather spent the time with the NoobToob Army. If you want a second opinion, I encourage you to check out Comic Vine’s review. If I return to that show, it will be as an art exhibitor.